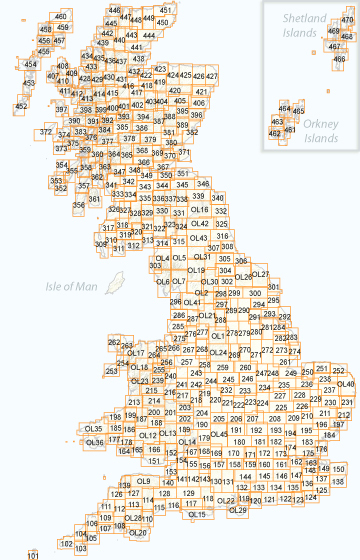 A series of 403 detailed topographic maps from the Ordnance Survey, covering every part of England, Scotland and Wales at a scale of 1/25.000. Ideal for walking and other outdoor pursuits it includes National Trails and selected other long-distance paths , Recreational Paths, picnic areas, viewpoints and selected places of interest. In addition, there’s Rights of Way information for England and Wales (except for Scotland where different laws apply). Some sheets for popular areas like the National Parks, are still branded as Outdoor Leisure (OL) maps, but are now included in this series as the cartography is the same as that in the Explorer Maps. These highly detailed maps show all the administrative boundaries, settlements as small as isolated farms, road network down to unfenced roads and country tracks, and field boundaries (hedges and dry stone walls) which make navigation across the countryside much easier. Steep gradients on roads are indicated. Various landmarks, eg. Power lines, archaeological sites, windmills, churches and lighthouses are shown, and additional graphics indicate natural terrain features such as cliffs, scree, mud and vegetation variations. The maps are fully GPS compatible. Tourist information includes caravan and camp sites, Park & Ride locations, recreation/leisure/sport centers, museums, historic buildings, English Heritage and National Trust sites, rural pubs, etc. The map legend is in English only, except for the tourist information content which is also in French and German. Each title is also available in a waterproof and tear-resistant version. A series of 204 detailed topographic maps from the Ordnance Survey covering the whole of Britain at 1:50,000. The maps provide plenty of recreational and tourist information, indicating the traditional public right of way paths (except for Scotland where different laws apply), including bridleways and byways restricted or open to motorized traffic. National Trails and selected other long-distance paths are marked, as well as on-road and traffic-free cycle routes with their National/Regional Cycle Network numbers. Standard information contents finely graded road network, railway lines with stations, cuttings, embankments, etc; Further individual isolated buildings; archaeological and historical sites, etc. A range of symbols highlights camping and caravanning sites, youth hostels, tourist information offices and visitors’ centers, parking and picnicking places, World Heritage sites, sport and recreational facilities. The maps are fully GPS compatible. The map legend is in English only, except for the tourist information content which is also in French and German. Make the most of your holiday with the OS Travel Map – Tour series. A series of Ordnance Survey’s general tourist regional mapping at different scales for selected counties and popular areas of Great Britain. Each map is one-sided and displays simple, easy-to-use road information, with insets showing street plans of selected city centers and enhanced tourist information. The series is aimed at the tourist market and is good for touring and local route planning. In addition, each map features selected individual town navigation maps to aid driving through busy urban areas, and an index of place names.